Happy Summer! I am so excited about this Summer Blog Post Tou.! 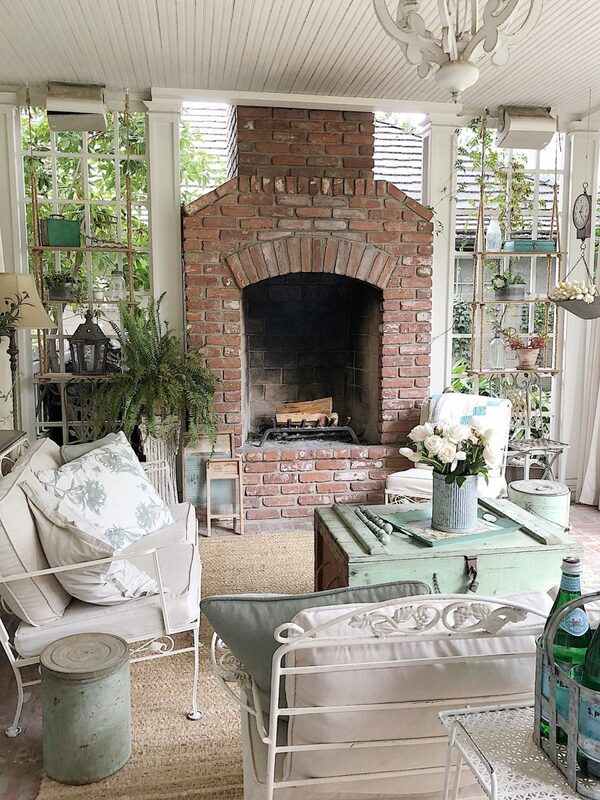 I have teamed up with some of the most amazing bloggers who have inspired me to refresh my back porch. Be sure to check out all of their wonderful blogs as there is so much inspiration to see! The links are at the bottom of this blog post. After walking around and staring at my porch for days, I have decided to add color to our back porch! My subtle (and kind of boring) gray and white color scheme has been replaced. I have gone green and I love it! It took me about two full days to redo the porch. Most of the time was spent visualizing and “shopping” in our third-floor storage (hoarder) room. It was one of the easiest makeovers I have ever done. 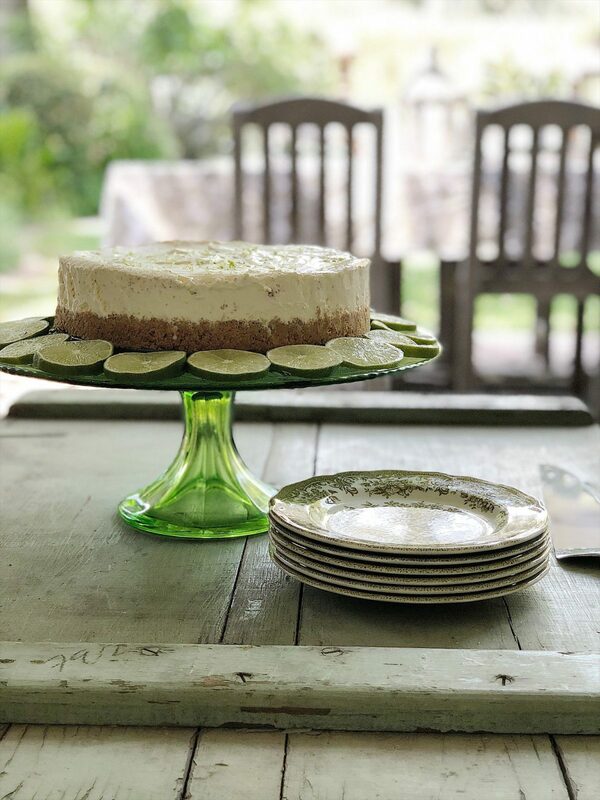 Today I am going to share lots of photos, share all of my sources and a recipe for a fabulous summer dessert. I am a big flea market shopper and a lot of my items are from the flea markets in Southern California. I always video my shopping trips on Stories and they are saved in my highlights on Instagram. 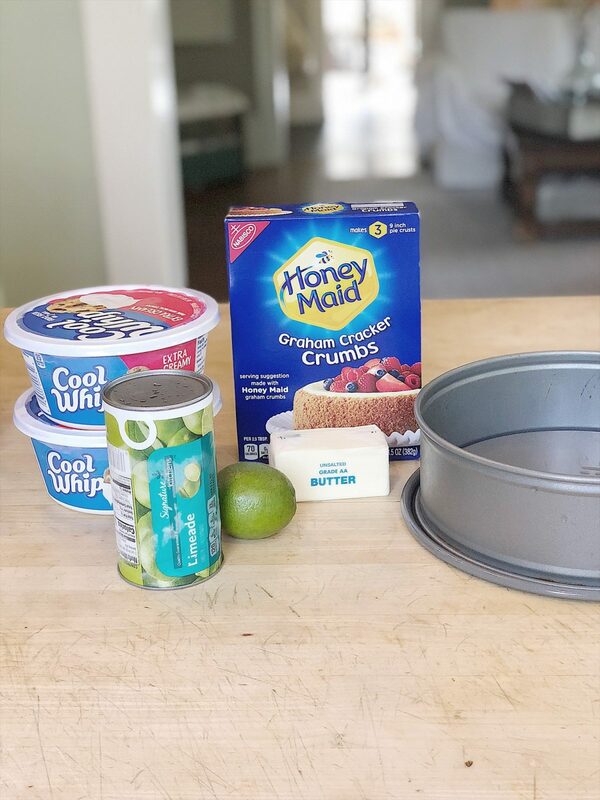 The recipe I am featuring today is the easiest dessert in the world. I am not kidding! It really is simple and so delicious! So why did I go green? That’s actually a very easy answer. A few years ago I had an obsession with sage green and everything in our house was sage green. After a few years, I grew tired of the color and fortunately kept all of my favorite decor items. Almost all of the decor items I used for my makeover were already in our home. Most of it was hiding on the third floor, which is a place I will likely never share because there is so much stuff stored up there that you can hardly walk. (Let alone take a photo.) But every time I go up there it’s like a shopping trip. So many good things for free! The first thing I added to the porch was the green trunk that I am using as a coffee table. I bought this a few months ago at the Rose Bowl Flea Market and I think I paid $75 for it. I fell in love with the color (duh) and knew immediately I had to have it. The two round green metal containers are also flea market finds and I found them for about $25 each. The boho beads on top of the trunk were made by my dear friend Kristi at The Pickled Rose. She has some of the best colors imaginable! Aren’t they the best? I bought these hanging wood shelves at Hobby Lobby a few years ago. You can certainly make them yourself or buy them here. I love how the $5 flea market green metal box adds so much color to the shelf! 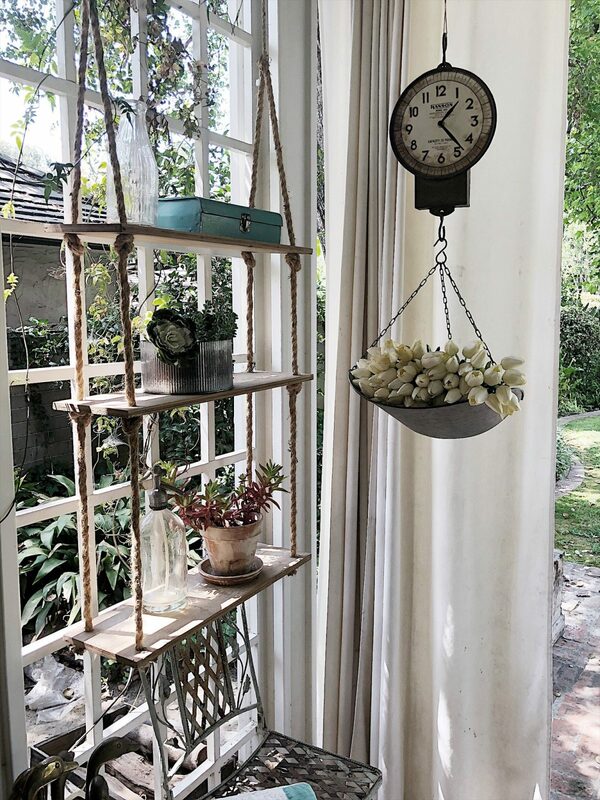 The scale/clock is from Decor Steals and the galvanized planter is from Save-on-Crafts. The weathered pots were a DIY I did on my blog last year. They were super easy to make and I loved how they turn out. Last summer I bought and painted the vintage furniture because it was rusted and one of the sofas were black! Fortunately, I found ready-made cushions at Pier 1 that fit perfectly. If you want to see how I painted the furniture, head to my DIY blog post. 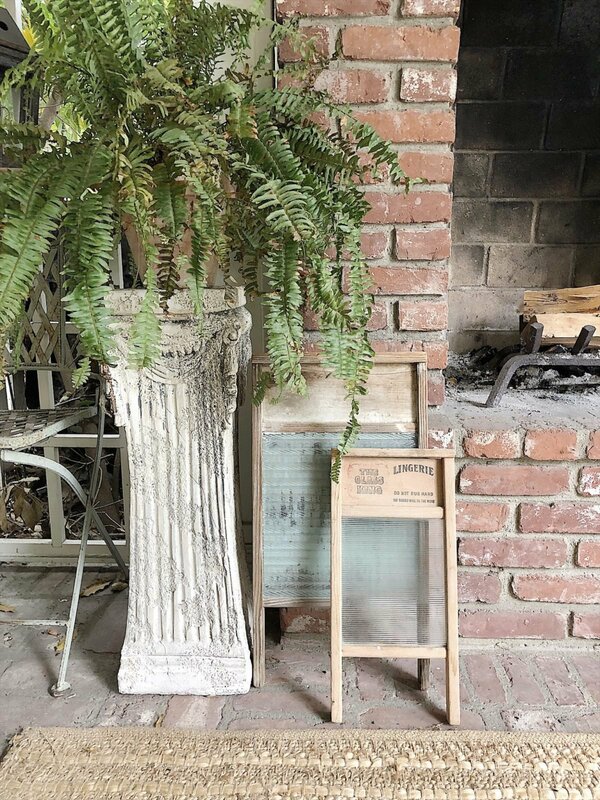 The concrete pillar and washboards are also flea market finds. I found the quilt and toile tray hidden in my stash on the third floor. Both of them were bought at a flea market at least five years ago. 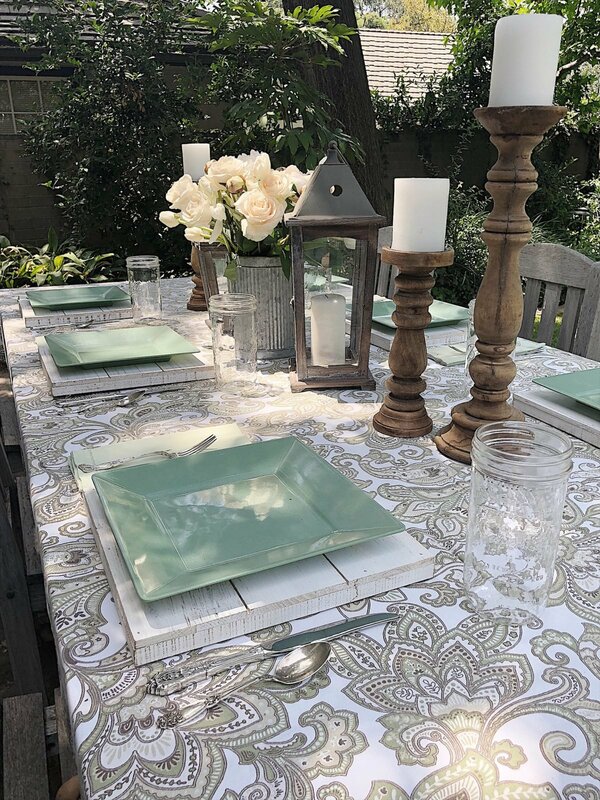 The table is set with green laminate plates from Target which I bought a few years ago. (I think I like these even better.) The square shiplap chargers are from Save-on-Crafts but they no longer sell them. 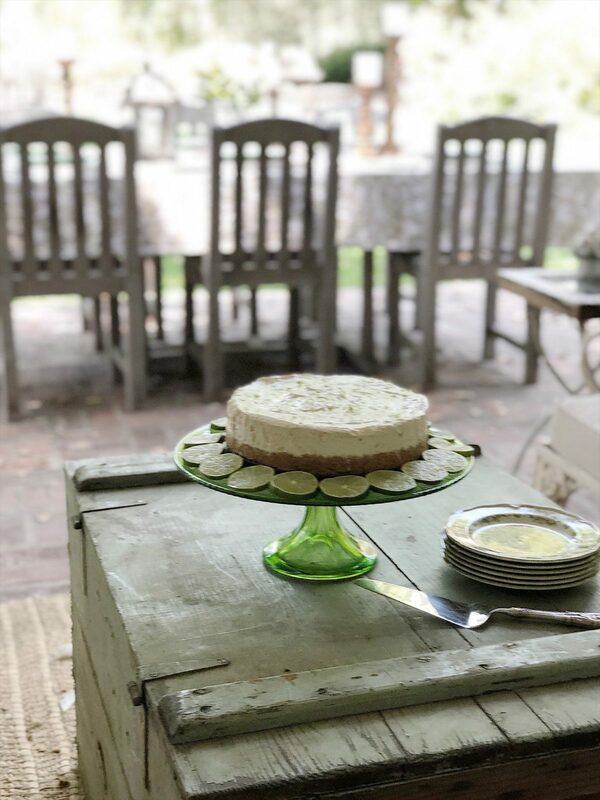 You can find round shiplap chargers from Jackie at Sawdust Angel. She handmakes them! 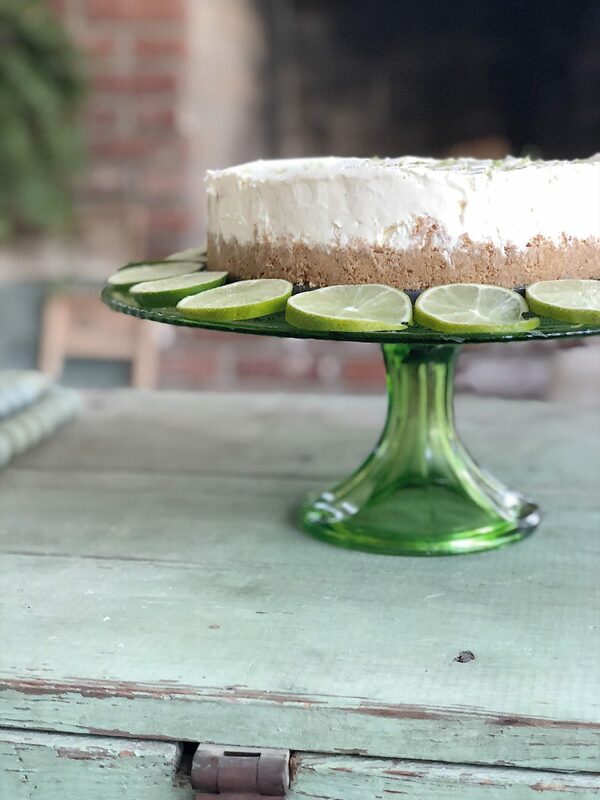 For this blog post, I made my favorite and easiest summer dessert, Frozen Limeaid Pie. 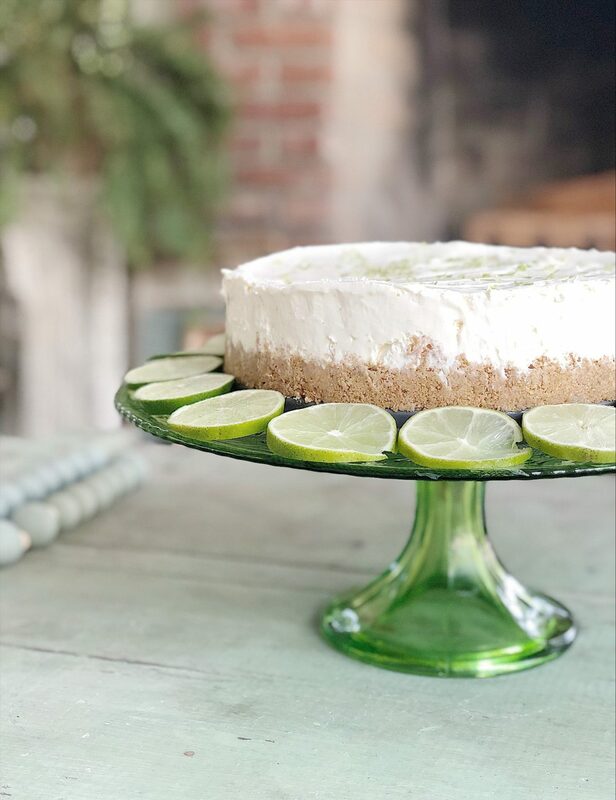 My son thinks it is Key Lime Pie but I don’t have the heart to tell him the filling only has two ingredients! Melt the cube of butter. In a small bowl, mix two cups graham cracker crumbs, melted butter and sugar. Press in the bottom of a lightly greased springform pan. In a large bowl, add the cool whip. Stir in the limeaid concentrate and fold together gently until combined. Pour mixture into the prepared pie crust. Spread out evenly. Grate fresh lime zest on top. Place pie in freezer for 6 hours or overnight. These are the only ingredients you need! I just love how this pie is such a perfect addition to a summer meal served outside! It’s refreshing and so easy to make. It is amazing what a difference it makes when you add color to a room. 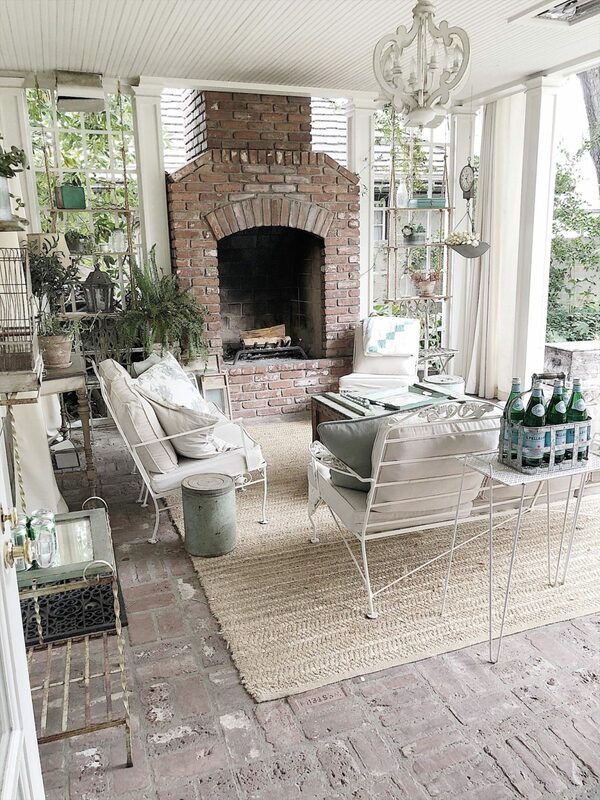 I have always loved our back porch but the extra pop of green really makes a difference! that pie looks amazing, leslie!! I love all the touches to your home and yes to shopping in the home! love it! So fun to be a part of this tour with you. Thank-you for having made it so easy to print your recipes ! I print every one of them and put them in their special binder labelled “My100 year old home recipes ” by Leslie . I agree with Yuni ! It is so fun to be part of your blogs and IG stories . Lucky us!! Leslie that pie sounds heavenly. Seriously have such a sweet tooth right now. Haha! 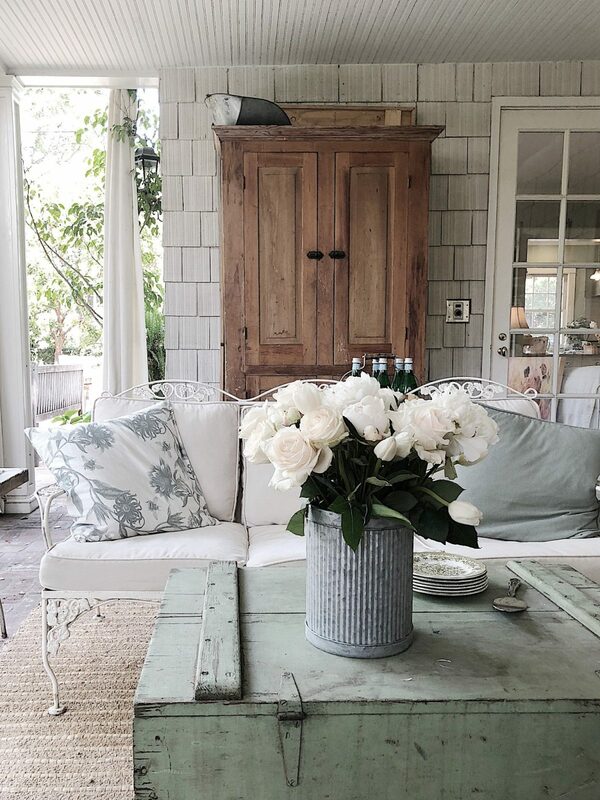 Beautiful touches to your outdoor space! Leslie! I mentioned on IG that I love that pie! 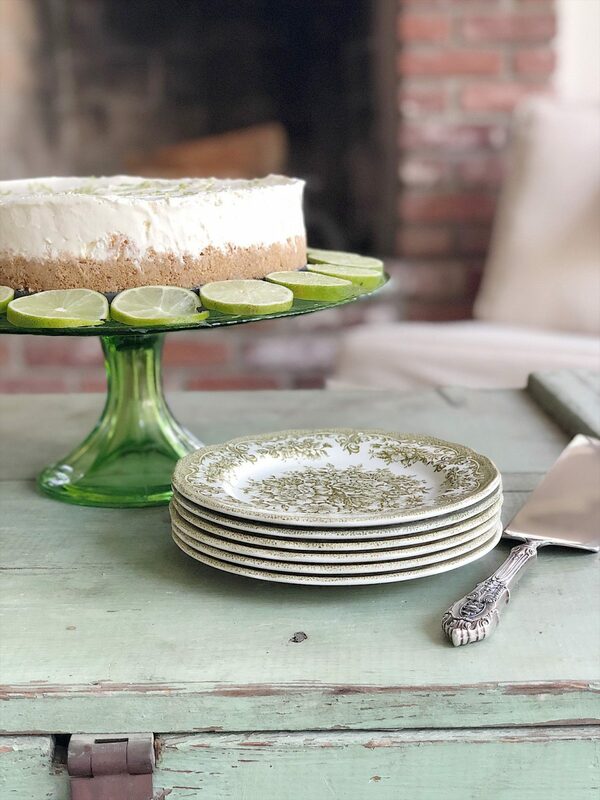 Thank you for the recipe and I am loving your green accents. 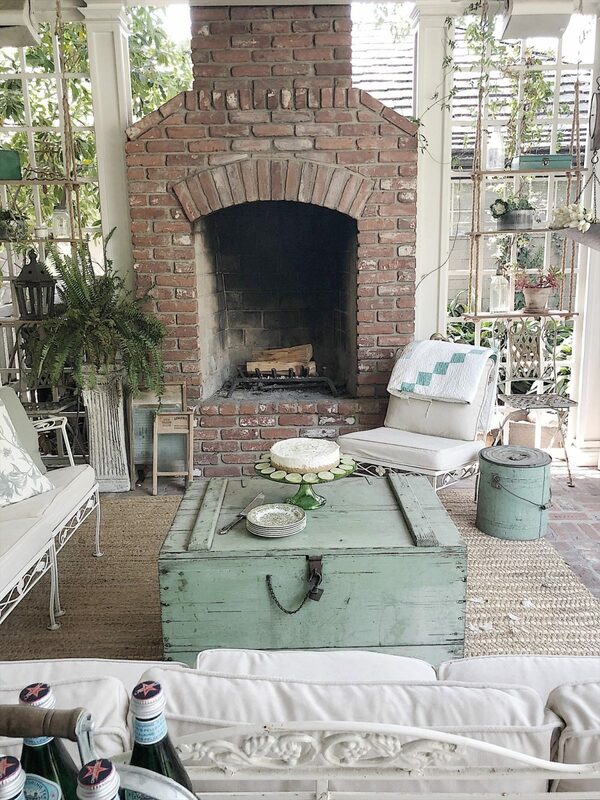 I am totally obsessed with your vintage green chest that you are using for a coffee table! Such a beautiful space you have. Lucky you! 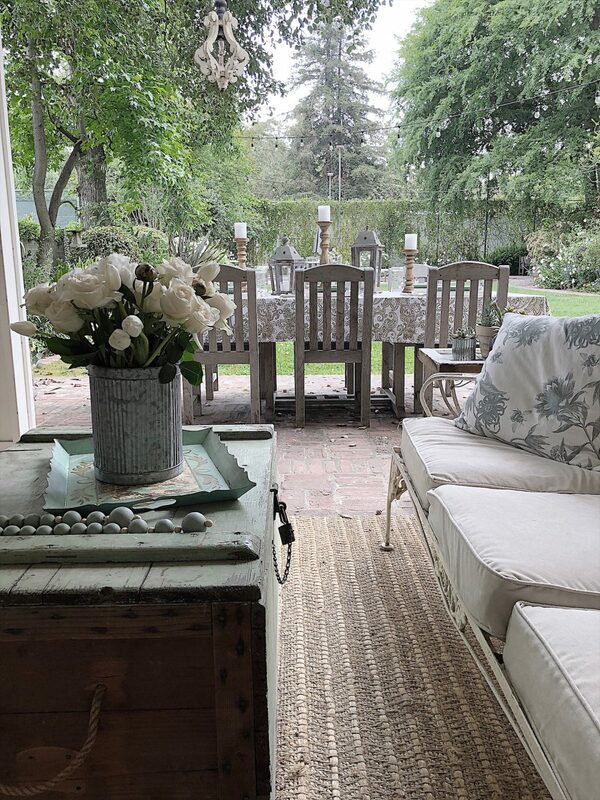 Leslie your porch is absolutely breathtaking!! 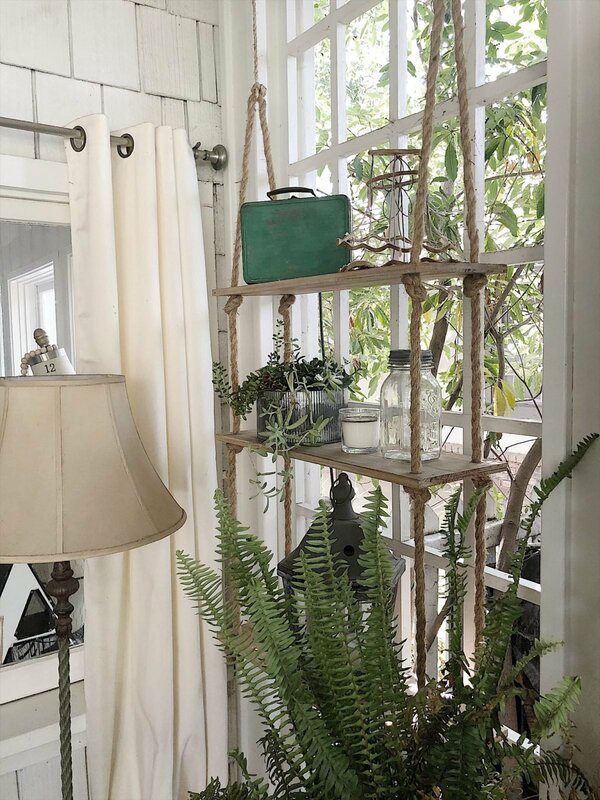 I love all your flea market finds and soft green accents! Can’t wait to try your pie recipe ???? My Goodness! I have 90% of your items! I’m so excited to copy in my 100 year yard! Thank you for posting! I have zero talent in decorating! I will add the pie too!???? Leslie this is just so beautiful! I love the updates and that recipe is a must try for us! I think my mom used to make something very similar growing up. Super yummy! That pie looks amazing and love how easy it sounds to make! Love the beautiful summer updates! It looks stunning and that trunk is beautiful! I plan on making this dessert. May I ask what size of springform pan you are using? Looks GORGEOUS!!!! That trunk is fabulous! Great job shopping your 3rd floor store- you have some amazing things!!! While the pie is lovely, I found it to be too tart. I suggest a little less limeade or use coco whip made from coconut milk. The coconut & lime flavors are great together. Beautiful blog! 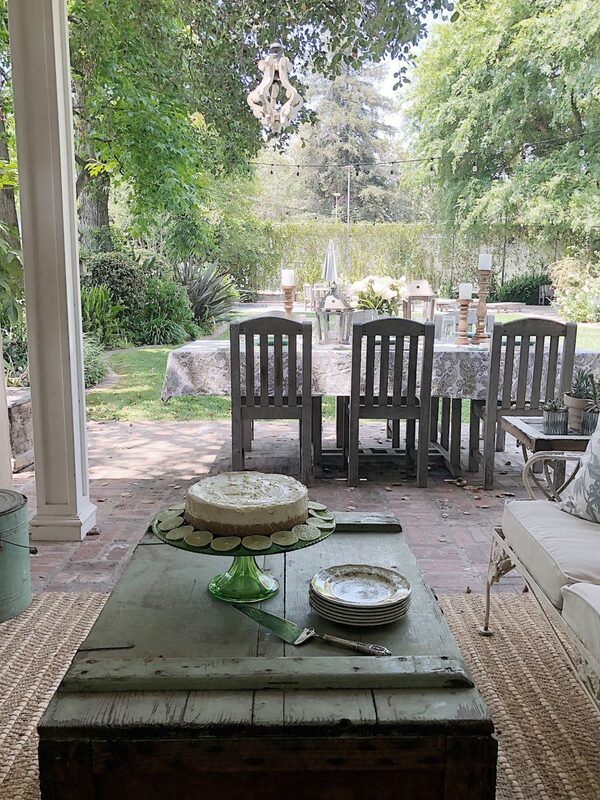 Leslie, your back porch is so dreamy and that dessert looks so yummy!! We gotta try that!